Drum paddles also known as lifters are an important consumable part for your washing machine, renewing your drum paddle is relatively easy and will improve performance if the drum paddle is worn. Make sure that you select the correct type of drum paddle for your washing machine, all manufacturers use different variations and there are specific ones for certain models. Safety first: unplug the washing machine from the mains power supply. Remove the old drum paddle by inserting a screwdriver or similar instrument down into the third hole, this pushes down on to a metal tab and releases the drum paddle from the drum. You can now pull the drum paddle away from the drum. To fit the new drum paddle make sure that the 3 pips located on the outside of the drum paddle are facing outwards and ensure that the clips at the bottom line up with the holes on the washing machine drum. then push down on the drum paddle and push to so that it fits into place. the information provided is for a Hotpoint washing machine drum paddle version 3 so may vary on your washing machine. 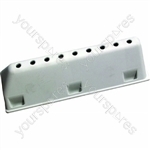 A quality NonGenuine Replacement washing machine Drum Paddle spare part suitable for selected Beko appliances. A Pack of 3 X quality NonGenuine Replacement washing machine Drum Paddle spare part suitable for selected Beko appliances. Genuine Replacement washing machine Drum Paddle spare part suitable for selected Beko appliances. Genuine spare part suitable for selected Electrolux, Aeg Electrolux and Zanussi washing machines. Was weary that these would not be suitable because of how cheap they were but they were a great product, easily installed in minutes and so far doing the job.